This bundle includes the full GameDev Handbook collection: A hardcover copy of the The GameDev Business Handbook, a digital copy of The GameDev Business Handbook, and a digital copy of The GameDev Budgeting Handbook. The GameDev Business Handbook is an instructional guide for creating and sustaining your independent video game studio. It features interviews with more than 25 prominent members of the industry, including Vlambeer’s Rami Ismail, Capybara Games’ Nathan Vella, Romero Games’ Brenda Romero, video game attorney Ryan Morrison, Klei Entertainment’s Jamie Cheng, Supergiant Games’ Amir Rao, Harebrained Schemes’ Jordan Weisman, and Ninja Theory’s Nina Kristensen. The Handbook features expert guidance and in-the-trenches anecdotes on budgeting and finance (complete with downloadable worksheets), incorporation, contracts and employment, intellectual property, press and public relations, and more. 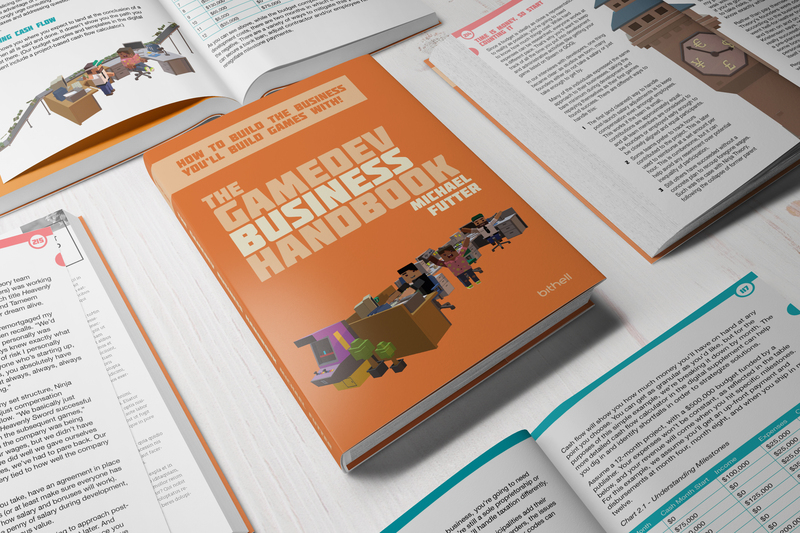 If you’re considering crowdfunding, early access, or pursuing a licensed property, The GameDev Business Handbook can help steer you toward success. The book features success stories and cautionary tales, with advice from those who have been where you want to go. An extension of the The GameDev Business Handbook budgeting chapter, The GameDev Budgeting Handbook takes a deeper look at costs in video game development. If you're coming to The GameDev Budgeting Handbook first because you specifically want to better understand the expense of various aspects that make up a video game, that's cool. This book is an explainer, breaking down a game budget and the expenses behind various elements. We consulted directly with the talented people working in the industry right now in order to get the most current and detailed information available. The Handbook features expert guidance and in-the-trenches anecdotes on budgeting and finance (complete with links to downloadable worksheets). Featuring all-new interviews with more than 25 prominent members from across the video game industry, including writer Rhianna Pratchett, actor Ashly Burch, composer Austin Wintory, Psyonix's Stephanie Thoensen, Harmonix's Cheryl Gehbauer and Dan Walsh, Ninja Theory's Steven Manship and many, many more across development, finance and legal disciplines. It’s a common question developers ask every day. From music to writing to voice acting, it’s hard to know just how much you should budget in order to make your game just the way you want. The GameDev Budgeting Handbook, a companion to The GameDev Business Handbook, takes you through different aspects of the development process. Whether you’re trying to determine when to hire a quality assurance team or need to know how much it will cost to hire a composer for your game’s music, author Michael Futter helps answer your questions. With interviews from dozens of active developers, writers, actors, lawyers, and more, you’ll find out just how to plan your project’s budget. Featuring expert advice from professionals working in and with the video game industry today, The GameDev Budgeting Handbook is a guide you’ll keep close by for years to come.